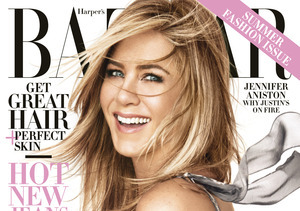 'Mother's Day' Star Jennifer Aniston on Jake Gyllenhaal's Crush, 'Friends' Reunion, and More! Jennifer Aniston and Jason Sudeikis are back on the big screen together, and the duo sat down to talk to "Extra’s" Terri Seymour about their new star-studded Gary Marshall movie, "Mother’s Day." During the candid talk, Jennifer commented on recent headlines that Jake Gyllenhall admitted he had a crush on her years ago, admitting, “That’s adorable... I wonder if he still does... hmmm." Jennifer also said that recent "Friends" reunion to honor director James Burrows "was great. It was like no time had passed, then we all went to dinner after, which was really nice." 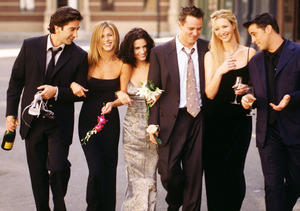 Only Matthew Perry was absent from the gathering. Speaking of her "Friends" co-stars, Jennifer said she did tune in to seen her TV ex David Schwimmer on "The People v. O.J. Simpson: American Crime Story." "Are you kidding? Yes, I did." She joked, "I’m so bummed that [O.J.] was not guilty and it was over. By the way, he got away with murder." Jason added, "That’s where the phrase came from." In spite of the series' dark content, Jennifer summed it up by saying, "It was really fun — I have to say it." 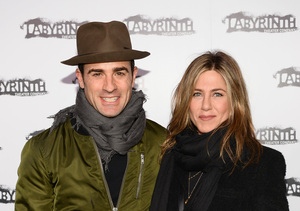 In "Mother's Day," Jennifer and Jason play single parents. In real life, Jennifer reveals that they go on double dates with their significant others, Justin Theroux and Olivia Wilde. “We played in London, that was fun," Jennifer said. The actors don’t get to see each other that often because they live on opposite coasts — Jason lives in New York and she is in California. "But we will be in New York, soon, like in a month, a month and a half — our apartment's almost done," Jennifer said. When she isn’t busy working, Jen is busy working out... but maybe not as often as people think. Jennifer volunteered, "I read something that was incorrect, that I work out twice a day — that’s not true." Jennifer gets up at 5 a.m. for yoga or Pilates, but if she's working, "I give myself an extra 45 minutes… I feel so much better." Keeping her killer bod at 47 takes effort, but Jennifer told "Extra" she breaks the rules sometimes. "I’m healthy, but I don’t deprive myself." She revealed Sunday dinner at her house is carbonara night, her hubby having reintroduced her to the Italian dish. "I thank him for the extra 10 pounds, too — he’s got to love it."